CubeBackup - How to adjust the subscription when new G Suite users are added and old employees leave? How to adjust the subscription when new G Suite users are added and old employees leave? Most other G Suite backup solutions require the G Suite administrator to add subscription for each new employee and remove subscriptions when an employee leaves. This can be quite a burden, especially for large organizations. By default, new G Suite users are automatically enabled in the backup. That is, when new users are added to your G Suite domain, CubeBackup will automatically include them in the backup list; when employees leave your company and their accounts are suspended or deleted, CubeBackup will automatically remove them from future backups. In addition, your CubeBackup subscription does not need to be modified each time there is a change. You only need to update the number of users in your subscription at the end of each payment cycle. The number of licenses is based on the number of accounts backed up - not on the total number of accounts in your G Suite organization. In order to make subscriptions flexible and easy to understand, the number of licenses required is calculated yearly at the end of your payment cycle. It doesn’t matter which users were added or removed throughout the year; all that matters is the number of users in the backup when the new payment cycle begins. A few days before your subscription renews for another year, we will send an email reminding you to update your licensing information. 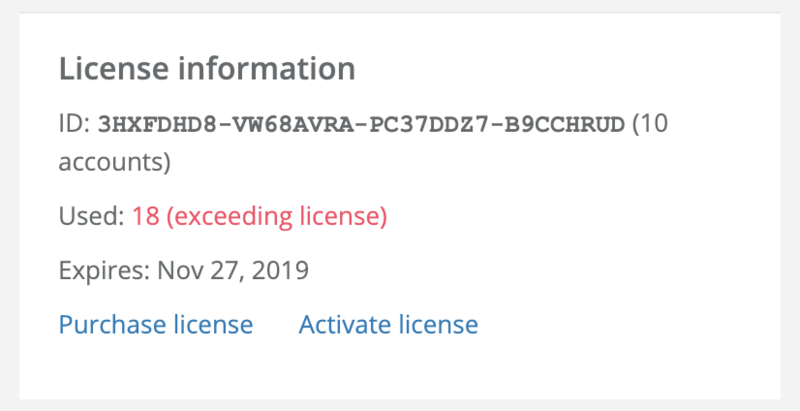 If you exceed the number of purchased licenses, CubeBackup will display a reminder on the overview page. This is just a reminder; you don’t need to update your subscription until the end of the payment cycle. We have made the subscription model for CubeBackup as simple and flexible as possible. CubeBackup will automatically add and remove users as they are added or removed from your G Suite domain(s), but subscriptions only need to be adjusted yearly. This should greatly reduce the burden placed on G Suite administrators. If you have any other questions about subscriptions, please contact sales@cubebackup.com. During each subscription period, you are free to add or remove G Suite users from the backup list at your convenience. In fact, most of the time, adding and removing users is done automatically by CubeBackup. A few days before your current subscription expires, you will receive an email from us reminding you to update your license information. You can reply to our email with the number of current active backup accounts. Or, if there is no change in your backup list, you can ignore this email. We will adjust your subscription based on the new number of backup users that you have provided. When the next payment is due, you will be charged according to the updated subscription. NOTE: Due to the limitations of Credit Card/PayPal systems, there is no way for customers themselves to adjust the subscription. Only merchants can adjust payment subscriptions. This is why you need to inform of the correct number of backup users each year so we can update your license accordingly.